Magna-Tiles Clear Colors 100 Piece Set Magna-Tiles clear colors 100 Piece set includes: 50 small Squares, 4 large Squares, 15 Isosceles Triangles, 11 Right Triangles and 20 Equilateral Triangles These tactile, colorful translucent Magna-Tiles are sized just right and easy to use, whether creating designs on a flat surface or building in 3-D. basic shapes are learned through play. Magna-Tiles develops patterning, shape recognition, building and motor skills. use them for guided activities or hours of open-ended fun and exploration. They will work well alone or together with the solid colored Magna-Tiles to make windows, skylights, etc. perfect for classrooms and multi-child play. 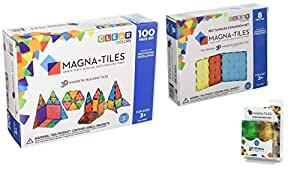 Magna-Tiles clear colors 100 Piece set includes: 50 small Squares, 4 large Squares, 15 Isosceles Triangles, 11 Right Triangles and 20 Equilateral Triangles These tactile, colorful translucent Magna-Tiles are sized just right and easy to use, whether creating designs on a flat surface or building in 3-D. basic shapes are learned through play. Magna-Tiles develops patterning, shape recognition, building and motor skills. use them for guided activities or hours of open-ended fun and exploration. They will work well alone or together with the solid colored Magna-Tiles to make windows, skylights, etc. perfect for classrooms and multi-child play. Expand your Magna-Tiles collection with Cars! The 2 Car Expansion set comes with 2 6x3in Cars. Each Car has 14 magnets, allowing children to build right on top of them. Children are also able to stick them together to create a train. This set is perfect for the Magna-Tect on the go. Expands your Magna-Tiles collection to build even bigger structures! The 8 Piece Rectangles Expansion set comes with 4 Rectangles and 4 Large Squares. This set is perfect for the Magna-Tect that wants to build bigger and taller! The rectangle is only available in this set. So, my addiction with these blocks started about 2 years ago, when my son turned 1. Given, at that time he was unable to play with the two sets we had bought form a major big box retailer. The sets happened to be 25% off at that time of year and I jumped on two boxes and stored them for a bit. When my son turned 2 the blocks started being played with. Every since its been a uphill battle to not buy more pieces consistently. At this time we have 3 sets in use, approximately 300 pieces and I have two more boxes (100 pieces each) for my sons upcoming birthday, which will put us over 500 pieces. So why are these blocks so important to our lives you ask? Why invest so much money on these blocks? Please allow me to answer in a multi-tiered fashion. These things are almost entirely unlimited in regards to what they will allow someone to produce. When my son first started playing with them he would make ‘floors’ for his trucks to drive over, then it was simple enclosure unites, then enclosure units with roofs, then villages with roads and buildings, then airports and firehouses, etc… hence the reason we need more blocks. I am having a hard time keeping up with his very creative mind. These blocks for 100 bucks, or whatever u spend on them, trumps any other ‘setting’ toy you can buy, such as a TTT setting to run trains on which gets old after a while, although the tracks allow for imagination. Even with train tracks though you can only run trains on them. These pieces allow for you to, as described above, build whatever. My son has built house for his ‘stuffed animals’… heck… we even built some for his dinosaurs and for him on one occasion. So easy to store and for the analytical/OCD type person who loves to clean up after their kids, these blocks are ideal. A few minutes and they are exactly as neat as they were when they first arrived in their original packaging. Not many toys can offer that… not to mention these avoid the infamous ‘middle of the night’ stepping on a (little block) and screaming murder. I DID NOT receive any sort of discount on this product. I do not receive any perks for writing this review other than knowing that I possibly helped lead you to buy these blocks for your child or children to play with. That in of itself would be rewarding enough or me and make me happy for having taken the time to review these blocks. My son calls these things ‘sticky blocks’ and they are one of his favorite toys. We really have played with them for at least a half an hour to 3 hours for the last 6 months straight. I’d say, its a bit much, (the playing that is), however, I know with my son we are going to play..it is very rewarding to know I am doing my job as a parent and able to find some ‘enjoyment’ myself in watching his little brain expand before my eyes… These are the epitome of the type of item you buy to enrich your kids life. I took a while to buy a STEM toy/product in that I wanted to buy the right one… this one.. on the 4th purchase continues to reaffirm my belief that there is no better toy available out there. Questions? I’m happy to provide additional thoughts should you have any questions. When I first saw these things I was shocked at how crazy expensive they were, but some of my other “mom friends” assured me they were well worth their weight in gold. They were right! Magna-tiles rock! My kid plays with these things a ton and I can really see the gears working in her mind when she is engaged in one of her many building projects. So yes, psychotically expensive, but go for it! You won’t be disappointed! As the mom of 2 boys, ages 6 and 8, I’ve seen a lot of toys come and go from our house. These are definitely one of the best. My youngest son was introduced to magna tiles at daycare when he was 3. He was always playing with them every single day when I went in to pick him up. At 4, he asked Santa for his own set of magna tiles, and knowing how much he loved them Santa got him the 100 piece set. He and his brother played with them almost every single day that year. Their only complaint was that they didn’t have enough tiles to build what they wanted. At 5, my son asked for another set for Christmas and Santa came through with another set of 100. Now at 6, almost 7, my son is asking for even more magna tiles, and I’m back for a third set of 100. He still plays with these all the time, and his 8 year old brother plays with him. They love these so much, and it is amazing what they build with them. Their creativity knows no bounds with these, and they never get tired of them. On top of that, these things are tough. Even our original set is still going strong. We haven’t had a single magna tile show any damage other than minor scratches. I know they’re expensive, but when you factor in how much they get played with they’re actually a bargain. I’ve bought so many toys that were a total waste of money because they never really got played with, or broke too soon. Not these. I would recommend these to anybody. My only regret is not buying some sooner. Be aware though that you do need alot of these to really build anything. I would say the 100 piece set is really the minimum except for maybe really young children. I also highly recommend getting a couple of the large 1-foot square tiles that are availble from another brand. They work great with the magna tiles and really make building large structures easier. Magnetiles are wonderful for both younger children (3-5) and older children (6-10). Younger children find them less frustrating than traditional blocks because magnetic fields aid in construction stability. Older children find their creativity peaked by the unexpected ways the blocks can hinge and hold together as opposed to building with traditional blocks.